Instant downloads of all 942 LitChart PDFs (including Bless Me, Ultima). 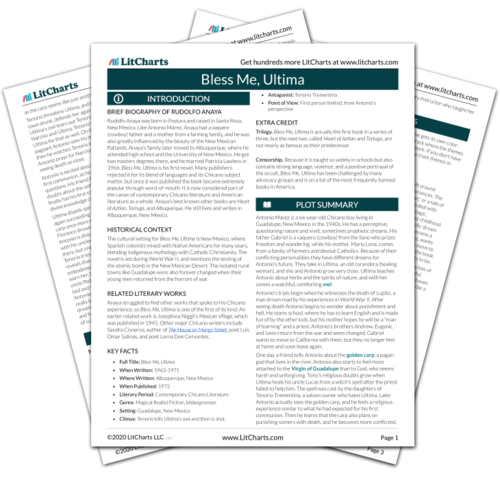 LitCharts assigns a color and icon to each theme in Bless Me, Ultima, which you can use to track the themes throughout the work. Antonio Márez remembers when he was six years old and Ultima came to live with his family. He begins the story as a child lying in bed and listening to his parents discuss Ultima. She is from Las Pasturas, the village in the llano (flatlands) where Antonio's father, Gabriel Márez, comes from. Gabriel was once a vaquero (cowboy) of the llano and enjoyed the freedom of the open spaces there. Antonio's mother, María Luna, is from a farming family, and she made Gabriel move away from the llano to the town of Guadalupe. Now they live on the outskirts of the town, just at the edge of the llano. This move wounded Gabriel's pride, and now he drinks often and laments his sons who are off fighting in World War II. The novel begins by setting up the opposing cultural forces that will influence Antonio's coming of age. The Márez way of life is restless like the sea that they are named for (mar means "ocean" in Spanish), while the Lunas prefer to stay in one place and work the land. The family's physical position – between town and llano – is symbolic of the marriage between María and Gabriel, and also of the state of Antonio's childhood at this point—he is in-between. They talk about how Ultima has helped them in the past and tended to María when her sons were born, and how it is wrong for her to be alone on the llano at her age. Antonio has heard that she is a curandera, a magic healing woman with knowledge of herbs and ancient remedies. Some people think she is a bruja, or witch. Antonio's parents decide that she will come and live with the family. Curanderas use healing practices of the indigenous peoples and are often accused of being witches. The fact that María, who is a devout Catholic, also respects Ultima so highly is an example of the mix of cultures and religions in the Chicano culture where Antonio grows up. Antonio starts to fall asleep and he prays to the Virgin Mary. María wants him to become a priest someday, but she does not know about the vivid dreams he sometimes has. He sleeps and starts to dream of a mud hut in Las Pasturas, the site of his own birth. He sees an old woman in black deliver a child (which he realizes is himself) and bite off the umbilical cord and save it with the afterbirth. Antonio's dreams add to the plot's narrative and also enhance the magical realist elements of the story, as he seems just as "magical" with his dreams as Ultima will be later. María's specific dream for Antonio's priesthood will be a huge influence on his development. In the dream the Lunas and the vaqueros both try to claim the baby Antonio as their own. María's brothers want him to become a farmer like them, and they smear him with earth and surround him with vegetables, but the restless cowboys replace the plants with saddles and whiskey. They want him to be a free vaquero like they are. The families start to fight over who will receive the afterbirth until the old woman stops them, saying she will bury it herself – she will be the only one who knows the child's fate. This dream is a physical representation of the struggle already going on inside Antonio. His mother's family wants him to become a farmer or priest like them, and his father's family wants him to return to the llano as a vaquero. But neither are given the final word – only Ultima knows his fate, but she does not choose one way of life over the other. Get the entire Bless Me, Ultima LitChart as a printable PDF. Antonio wakes up and thinks apprehensively about leaving his mother and going to school for the first time soon. His sisters, Deborah and Theresa, giggle and ask rude questions about Ultima before she arrives. María gets angry and demands that they respect Ultima and call her "La Grande." Antonio asks about the details of his birth, and his mother unknowingly confirms that the dream was true, and Ultima really did bury the afterbirth herself. María then complains a bit about the drunken, wandering vaqueros and predicts that Antonio will be a true Luna, and maybe even a priest someday. Antonio wonders who will hear his confession if he is a priest, but his mother doesn't hear his whispered question. Ultima is about to arrive at a stressful time in Antonio's life – he is leaving home to go to school for the first time soon. This is a very concrete step in growing up, and Ultima will appear to guide Antonio to resolve the conflicting cultures acting upon his development. María confirms the differences between the family's wishes. That she venerates both priesthood and curanderismo (Ultima's powers) in the same breath shows the blend of culture and religion even in this small household. Antonio goes to his friend Jasón's house, one of only three on their side of the river. Everyone around only speaks Spanish – Antonio won't learn English until he goes to school. Jasón's mother says he is away talking to an Indian who lives in a cave in the hills. His father has forbidden Jasón to speak to the Indian, but he keeps going back. Again Anaya keeps introducing juxtaposed elements of Spanish and indigenous culture – he reminds the reader that all the characters are speaking Spanish, which is emphasized by the many Spanish words scattered through the text. At the same time Jasón is drawn to the Indian in the hills, a representative of the indigenous culture. Antonio leaves and goes to work in the garden. The land of the llano is too rough for farming, but his mother wants him to try and it makes her happy, so he does it. Soon the family's truck approaches: it is Gabriel returning with Ultima. Theresa is afraid, but Deborah, who speaks only English now, reassures her. María scolds them and warns them to be respectful. The garden seems symbolic of Antonio's own growth – caught between town and llano, an attempt at farming on a place meant for riding horses, trying to please both farmers and vaqueros at once – its growth is arduous and slow. Antonio's sisters are more influenced by the English-American culture of their school than the rest of the family seems to be. Ultima steps from the truck and the children greet her formally, but when Antonio takes her hand he feels a sudden whirlwind and a rush of the power of Nature. He calls her by her real name and María rebukes him, but Ultima says she knew they would have a special connection, as he was the last child she delivered to the family. Antonio knows that Ultima is only one who knows his fate. Ultima says she has come here for the last days of her life, but Antonio protests that he will protect her and never let her die. Antonio and Ultima share an immediate connection, and Ultima evokes images of nature and magic, the whirlwind of the llano and knowledge of Antonio's destiny – these are unexplained supernatural powers that Antonio has not experienced before. He instinctively trusts Ultima though, showing that perhaps what Ultima symbolizes has been lacking in his mostly Catholic home. Ultima enters the house and Antonio smells the fragrance of many herbs surrounding her. An owl arrives that night and starts to hang around near the house. At first Antonio fears it and thinks it is a bad omen, but soon he realizes Ultima's owl is a comforting, watchful presence. That night he dreams of the owl and the Virgin of Guadalupe gathering the children in Limbo and flying them to heaven. Ultima's herbs recall the incense of a Catholic priest, and the owl is first introduced as a symbol of Ultima's presence. Its immediate association with the Virgin Mary in Antonio's dream shows how seemingly opposing ways of life are already blended together in Antonio's mind – he can already encompass the conflicted multiple cultures of the Chicano identity. Cosby, Matt. "Bless Me, Ultima Chapter 1 (Uno)." LitCharts. LitCharts LLC, 20 Nov 2013. Web. 20 Apr 2019. Cosby, Matt. "Bless Me, Ultima Chapter 1 (Uno)." LitCharts LLC, November 20, 2013. Retrieved April 20, 2019. https://www.litcharts.com/lit/bless-me-ultima/chapter-1-uno.